Want to Share a Cuppa? In the afternoon (or sometimes mid-morning), a cup of tea wants a little bite to accompany it. I think this is what scones were invented for. I like them just a little bit sweet and crumbly. I’m constantly trying new scone recipes. My goal is to some day settle on two base recipes, one using cream or milk and the other with buttermilk. That way I can accommodate the current dairy supply in my refrigerator. My choice of mix-ins can always be combined into either dough. I have a variety of flours in the pantry, most of them from Bob’s Red Mill, leftover from various recipe experiments. A local grocery store (though my least favorite one around) stocks a large inventory his products. I will visit that store for flour. My recent favorite is buckwheat flour. I’ve been substituting it for some of the regular flour in assorted baked goods. I like the earthy undertone it adds, and the slightly purple color of the end product. 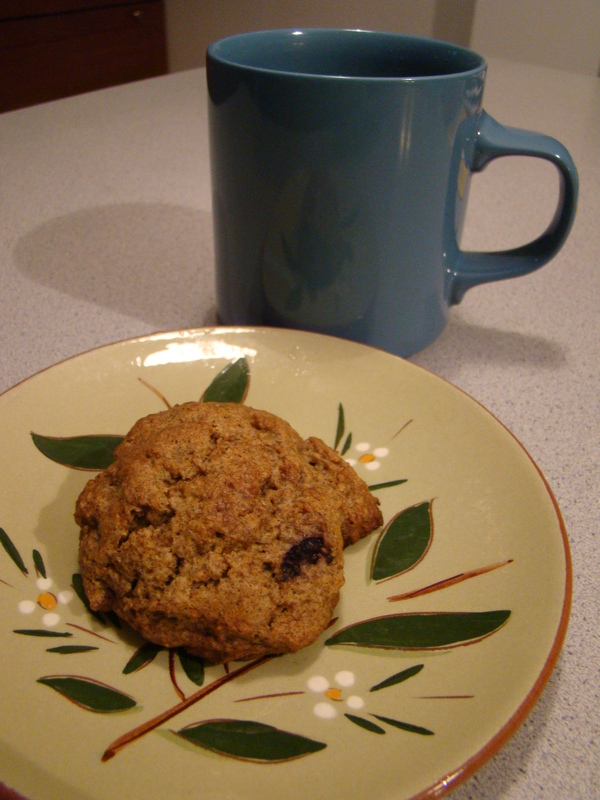 With a recent excess of blueberries, picked next to the dock of our Maine cottage, I had blueberry scones on my mind. Using some buckwheat flour gave my scones the rustic look I had in mind. When you’re in the neighborhood, you’re always welcome to stop by and join me for a cup of tea, a scone (or two), and a chat! Preheat the oven to 400F. Line a large baking sheet with parchment paper. Measure the flours, baking powder, baking soda, and salt into the food processor and pulse to combine. Add the butter and pulse until the mixture looks like coarse corn meal. (You can process about 10 seconds before starting to pulse, if you’re not that patient.). Transfer the mixture to a large bowl. In a separate bowl, lightly whisk the eggs. Add buttermilk and extracts and whisk to combine. Pour the egg mixture into the flour mixture and stir just until the flour is incorporated. Add the berries and stir gently to combine. 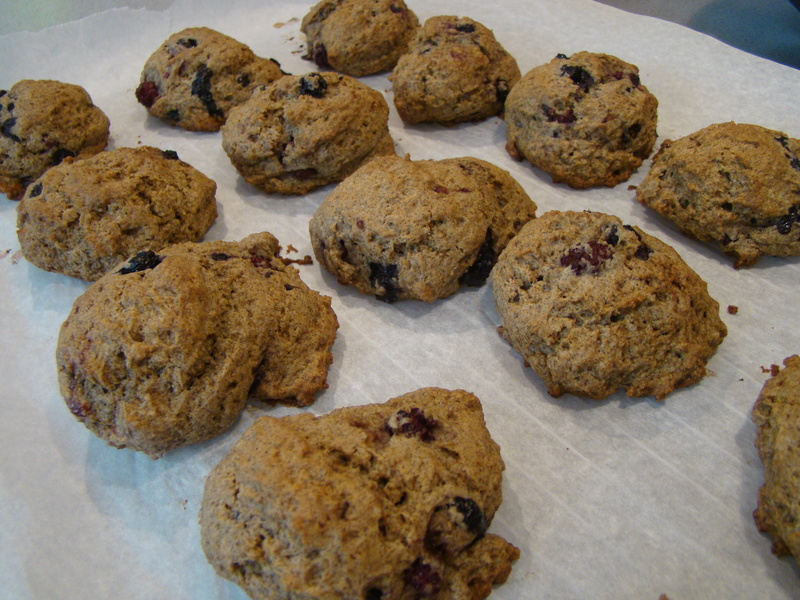 For each scone, scoop about ¼ cup of dough onto the baking sheet, about 2 inches apart. I use an ice cream scoop that’s about this size. Bake the scones for 15-20 minutes, until the tops are brown and a toothpick inserted in the center comes out dry. Remove from the oven and let them sit for about 5 minutes on the baking sheet. Then transfer the scones to a rack to cool further, or just eat them warm! I find that scones freeze well. If I take one from the freezer in the morning, it’s defrosted and ready for a quick toasting in the oven later in the day. * Note that Bob’s Red Mill is a sponsor of the International Food Blogger Conference that I am attending later this week. In exchange for a discounted rate, I’ve agreed to write some blog posts about the conference and its sponsors. However, I purchased the flour myself and I’ve expressed my honest opinions in this post.